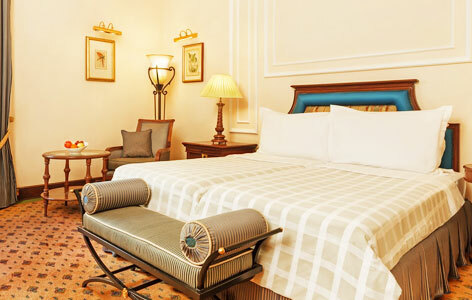 "Finding its establishment back to the late 1880s, The Oberoi Grand is one of the best luxury heritage hotels in Kolkata, exuding a royal colonial style with modern additions. The hotel welcomes both leisure and business travelers, providing them a comfortable stay. The rooms and suites of the hotel are well-equipped and well-furnished. The dining venues offer fine-dining experiences through sumptuous world fares and impeccable services. 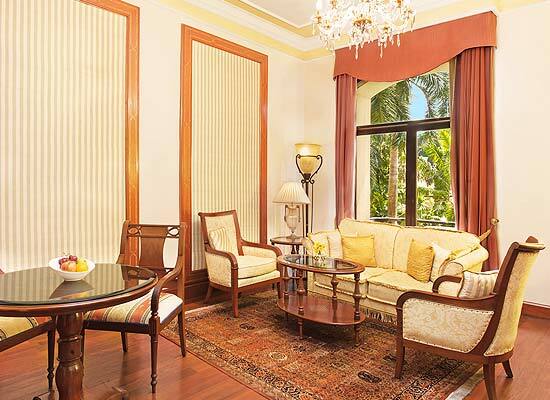 One of the most popular landmarks in Kolkata, the Oberoi Grand dates back to the late 1880s. Since the time of its construction, the property has played host to the leading figures and VIPs, be it during the colonial times and even today. It has the largest pillar-less ballroom in the city where several grand parties are hosted. 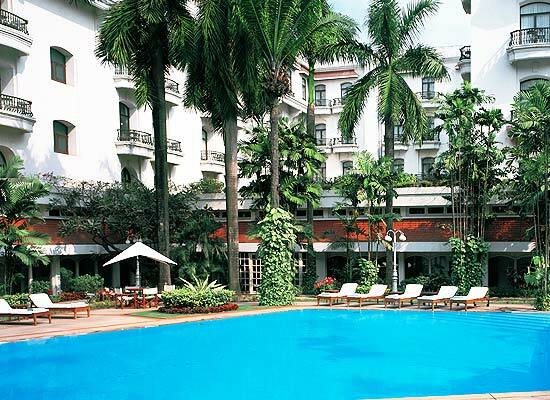 The hotel is fondly known as the ‘Grand Dame of Chowringhee’. This was the first hotel, which was acquired by the founder of The Oberoi Group, Rai Bahadur M.S. Oberoi. He gave this property, a combination of classic style and tradition with modern comforts. Accommodation at The Oberoi Grand in Kolkata is filled with world-class facilities and amenities, offering a pleasant stay to the guests. The fully-equipped rooms and suites feature comfortable furniture, wonderful views of the city, the garden or the pool, and rich upholstery. They are ideal for business guests as well as leisure vacationers. Proper care of the guests’ security is taken through key-card security. Some of the common conveniences in the rooms and suites are 32 inch LCD TV, high-speed internet, housekeeping twice a day, round the clock in-room dining, pillow menu, ensuite bathrooms with complimentary toiletries, telephone and fax facility, stocked personal bar, tea/coffee maker and much more. An oasis of luxury, the Presidential Suite spreads in an area of 1,350 square feet and comes with glass-panel doors, high-ceilings, offering a comfortable stay amid world-class comforts. The suite comprises of 5 balconies with views of swimming pool and garden, an elegant living room, a dining room, two bathrooms that are attached with two spacious bedrooms and have four-poster beds. The balconies offer views of the hotel’s landscaped garden and the outdoor swimming pool. The stunning bathrooms have a sunken bathtub that is accessible through red granite steps. The lavish bathrooms feature a shower cubicle with multi-purpose shower, bathrobes, complimentary toiletries, and cotton towels. A separate living room, 4 balconies with garden views, a master bedroom with four-poster bed are a part of the luxurious and capacious Luxury suites, which cover an area of 1,000 square feet. Through the huge glass doors natural light peaks into these suites that have high ceilings. The lavish bathroom have red granite steps leading to a full-length bathtub. The other comforts here are a separate red -granite cubicle, twin washbasins, complimentary toiletries and spotlighted mirrors with hand-painted Mughal designs. 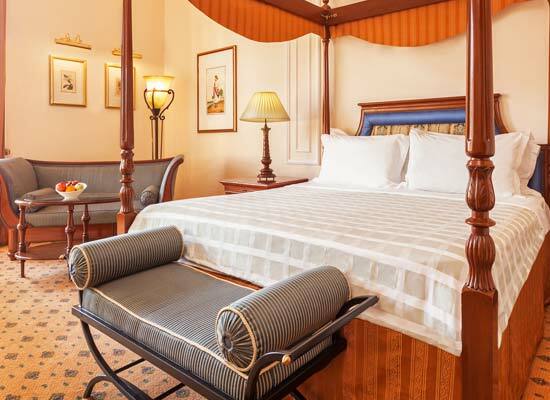 Chairs with ornate carvings, classic furnishing, four-poster bed with canopy, sofa and armchair in gold upholstery, wall-to-wall carpet give these suites an extremely plush look. Enjoy modern comforts such as huge walk-in wardrobe, an electronic safety deposit, personal bar, and 32 inch LCD TV. Covering a huge space of 750 square feet, the capacious and elegant Deluxe Suites come with a huge living area, lavish bathroom, a powder rooms, 2 private balconies and, a master bedroom with canopied four-poster beds. The glass double doors allowing natural light to come in and shiny off gold silk wall panels look wonderful. The chairs have rich upholstery. From the balconies, guests can enjoy the views of the pool, the city and the garden. The bathroom has bathtub with red granite steps, separate shower cubicle, bathrobes, slippers, sunken washbasins and framed mirror with Mughal patterns. Sprawled in an area of 500 square foot, the capacious Classic Suites comprise of a tastefully-done living space, a huge bedroom and a lavish bathroom. Sit in your balcony or the plush armchair and treat your eyes to the wonderful views of the pool or the garden. Let the cool breeze flow into your room from the two private balconies. The tastefully furniture, writing desk, walk-in wardrobe, three telephone lines with fax facility, DVD player, Wi-Fi facility, 32 inch LCD TV, plug points in bedside tables and colonial- style king sized beds add to the comfort. Spread in an area of 505 square feet, the tasteful Executive suites are a blend of world-class comforts and colonial style. Guests can enjoy facilities such as high-speed Wireless internet, various in-room entertainment options, comfortable king-size bed and comfortable furniture. The double glazed windows with blackout curtains offers stunning views of the city. The ambiance of the rooms is soothing and peaceful. The plush bathrooms come fitted with a full- length bathtub, and other complimentary toiletries. Large windows and high ceilings look stylish in these spacious suites. Premier rooms with balcony let you admire wonderful views of the hotel’s landscaped gardens and the swimming pool. Let the cool breeze enter your room and refresh you completely. Wi-Fi, DVD player, wooden dresser, writing desk with plush armchair, glass-topped armchair, drawers with plug points and a 32 inch LCD television. Pick your option from twin bed or king/queen size bed. The attached bathrooms are equally modern and have all modern comforts including plush complimentary toiletries. Slippers, bathrobes, towels, full-length bathtub and mirrors with hand-painted Mughal designs are the other highlights. The elegant Premier rooms have comfortable furniture, glass-topped coffee table, colonial-style writing desk, options of king/queen or twin beds, and a luxurious chair. The other conveniences in the rooms include a 32 inch LCD TV, Wi-Fi, wooden dressers, a DVD player, desk drawers with plug points. Savor the views of the hotel’s garden and the swimming pool. The attached bathroom comes with special mirrors with Mughal designs and spotlights. The other facilities here are cotton towels, slippers, bathrobes, sunken bathtub, and complimentary toiletries. Luxury rooms offer wonderful city views from the double glazed windows that let natural light come in. These capacious rooms have high ceilings and a relaxed ambiance. The well-furnished rooms have wall-to-wall carpeting, rich upholstery with traditional prints and option of king/queen or twin beds. Other facilities here include 32 inch LCD TV, Wi-Fi facility, and various plug points. The attached bathrooms are equally plush and feature complimentary toiletries, bathrobes, cotton towels, hairdryer, full-size bathtub and huge mirrors with spotlight. Offering the views of the city and the bustling market, Deluxe rooms come with double-glazed windows that have blackout curtains, offering no disturbance from light and noise. These capacious, well-lit rooms have large windows and high ceilings. The elegant rooms have comfortable furniture, and fully functional living areas as well as bedrooms with plush carpets. Guests have an option of twin beds or queen/king size bed. The colonial-style rooms have all modern comforts including attached bathroom with a sunken bathtub, writing desk, Wi-fi and so on. Offering international fine dining, Threesixtythreeo is an amazing amalgamation of traditional and legendary features of the hotel and modern elements. The restaurant is located on the ground floor and comprises of a Bar, which serves fines of single malts and wines. The venue is filled with natural light that pours in from the large windows, offering a wonderful view of the swimming pool. The menu comprises of Indian, European, Japanese and Asian fares, along with customized single-origin desserts. Popular delicacies include Bengali classics, lobster thermidor, and smoked hilsa fish. There is a special widespread buffet lunch. The lovers of Japanese food can enjoy authentic sashimi and live sushi through bespoke Japanese menu. Impeccable service by the staff is the other highlight. 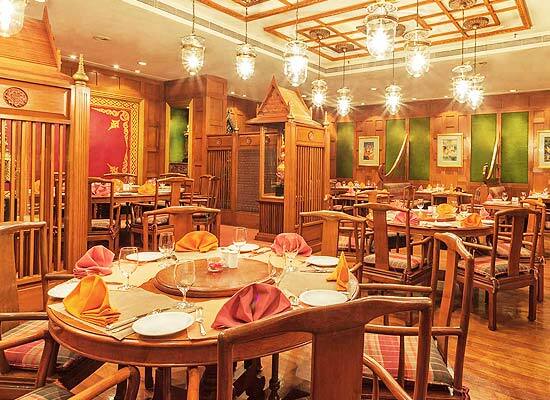 Baan Thai is the award winning restaurant at The Oberoi Grand, Kolkata, where the guests can relish authentic dishes of Thai cuisine. Ingredients are specially imported from Thailand. As you enter the restaurant, you are welcomed by 2 huge Singha lion statues and a life-size statue of Lord Buddha at the reception. Even the decor is inspired from the island nation as the walls are adorned with masks, Thai artefacts, and special wood carvings. Even the style of dining has been taken from Thailand as there are tables with traditional floor seating, which are segregated by carved wooden partitions. The vast menu comprises of vegetarian and non-vegetarian salads, steamed dumplings, spring rolls, rich curries, special curries and desserts. The well-stocked Bar at The Oberoi Grand is an ideal place to relax with your loved ones while savoring a glass of your favorite drink. The carefully curated menu comprises of premium global beverages, single malts, wines along with a list of snacks. Treat your eyes to the pool view while you admire the stunning interiors of the bar. Kolkata is the capital city of the state of West Bengal. Kolkata is considered to be a seat of intellectuals in India. In fact it is the city from where the maximum number of noble laureates in India has come up. The only Oscar winner film director of India is also from this city. The city has a strong historical foothold and houses a huge number of interesting spots to visit.